Choosing to specialize a nursing degree in nephrology is just one of many specialized paths you can take as a nurse. Though moving into a specialized field requires more education, it can be well worth your time since it opens career doors. With nephrology, there is the additional satisfaction of knowing you have played a role in assisting patients with kidney disease live fuller lives and learn to manage their symptoms. Since occurrences of chronic kidney disease have doubled in both of the last two decades, and 27 million adults in the U.S. now have chronic kidney disease, this is a highly important field. Any nurse wishing to work in nephrology will need to begin as a registered nurse (RN) or nurse practitioner (NP). From there, you will pursue an advanced degree, generally either a Master of Science in Nursing (MSN) or a Doctor of Nursing Practice (DNP). When you study for your advanced degree, you can specialize or concentrate in nephrology. In general, nephrology will be what’s called a “sub-speciality” that you concentrate on while focusing on working with a specific population of patients. Kidney disease or risk for kidney disease spans the age spectrum, so nephrology nurses may be trained to work specifically with adults, pediatric patients, or geriatric patients. Each population raises its own specific issues, and in each case, the nurse will be trained to work with and support families as well as the individual patient. Nephrology has been considered a specialized field for over 40 years since the federal government began funding treatment options for end-stage kidney disease. Most of the areas in which nephrology nurses specialize have to do with those different kinds of treatments. A nephrology nurse may specialize in areas that include hemodialysis, continuous renal replacement therapy, peritoneal dialysis and transplantation. The American Nephrology Nurses’ Association points out that sometimes nephrology practice overlaps with other nursing specialty areas, given the fact that kidney transplants, for instance, may be part of an overall transplant involving multiple organs. 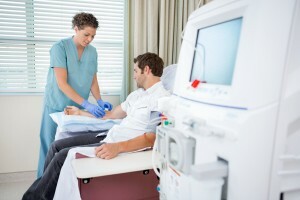 The Nephrology Nursing Certification Commission (NNCC) has established various criteria for certifications of advanced practice nurses in the following three areas: Certified Neprhology Nurse (CNN), Certified Dialysis Nurse (CDN) and Certified Nephrology Nurse – Nurse Practitioner (CNN-NP). These are considered the main areas of specialization. The criteria generally involve hours of specific work experience and continuing education credits. Once you have specialized a nursing degree in nephrology, you will discover that it can be important to keep abreast of continuing developments in patient care. In order to keep your certifications and keep your skills updated, you will likely engage in a number of accredited continuing education opportunities. There are several approved organizations who can offer such accredited opportunities, including ANNA, The American Association of Critical-Care Nurses (AACN) and others. Nephrology nursing is a demanding field that requires competent and highly-skilled nurses who are able to approach their patients’ care in a holistic way. If you work as a nephrology nurse, you could be involved in all kinds of work, from critical care nurse to nurse educator. If you decide to specialize a nursing degree in nephrology, be assured that you will be doing important work.